All inkpads are set as “last chance” because they are being redesigned! The case is a new, more intuitive design and they’ve improved the formula of the ink, as well! We will be getting NEW CORE COLORS!!! I can’t go into details yet, but believe me – these new colors are making me soooooo happy!! If you are interested in reserving your Stamparatus – please read through the following – to the end! Either TODAY or any day between December 5 and December 30 you need to know the following. Reservations open today (Dec 5) at 4:00 pm ET! If you are going to RESERVE a Stamparatus, the first thing you will need to do is set up an account in my online store here. You can do that now so you will be ready! Starting December 5 through December 30 – you will need to go to stampingup.com . There will be a link right on the home page to click to RESERVE your Stamparatus. Click on that link and you will need to follow the directions. You may order only ONE but there are no limits for customer orders so that reservation window will not close until December 30 at midnight (MT). This will RESERVE your Stamparatus. They will begin shipping March 19. It is important to know that they will ship ‘first order in – first order out’ so the sooner you order the sooner yours will ship. When your Stamparatus is ready to ship, you will get an email notifying you that it is in your cart. I will send out a reminder the first of March to remind you to watch for that email. You will be able to add to that order. IMPORTANT!!! The Stamparatus is $49 and Sale-A-Bration will be going on at that time. If you add anything to your order, you will qualify for at least one FREE item with that order! Please also use the Hostess Code that will be current at that time – you will find that on the home page here – inkup.us . Please also refer to the Q&A that will be posted there for additional information. If you still have questions – give me a call. 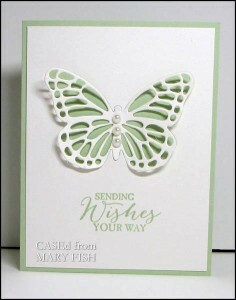 Although the backordered Butterflies Thinlits did not arrive in time to be ordered during Sale-A-Bration or the Free Shipping promotion, StampinUp does expect them to arrive before the end of April. I will continue to update you with the best information on the Butterflies Thinlits Dies and other backordered and unorderable items. Sadly, StampinUp has determined that the quality issues with the blendability markers is not fixable in a timely manner and has decided to discontinue their availability. If you have any questions or concerns regarding Blendabilities, please contact me! While this is sad news, remember that we do still have lots of options for coloring: Stampin Write Markers, Aqua Painters, and Blender Pens!